I've often wondered why I've come across certain people in my life. Why were they memorable even though we're no longer in contact? What was the reason for meeting them? And more recently, I've thought about what it was I "got" from the associations. 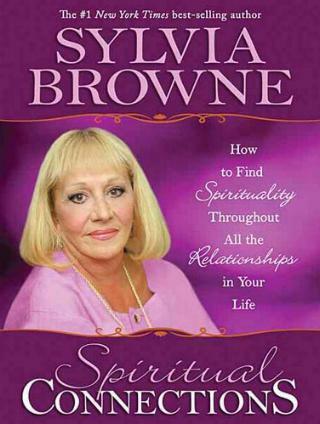 Tough questions for anyone to answer, but, I guess, not for Sylvia Browne. This woman never ceases to amaze me. In this book she touches on the relationships within families: mother/daughter; father/daughter; father/son; mother/son; romantic relationsips; how you perceive yourself and how others see you; relationships at work, and more. It's all how we relate to others that determines our own happiness. In other words, if we can't live with ourselves, how can we expect others to. How we are molded as children and at school also affects us. Of course she also talks about our spiritual side, in our make-up whether we like it or not, and how to recognize what we're doing. I found her writings on friendships extremely interesting as I've found myself in many similar situations - have had guilt and uncertainty about choices I made with regards to "friends". Ms. Browne also reiterates the Life Themes, which I find so fascinating. I wonder if we can have more than one - kind of mix and match, for that's how I feel. I was happy to read that she says we can. She also covers relationships and marriages which I found worth reading. My dearest wish is to have a meeting with Ms. Browne so that once and for all, I can unravel the mystery that is my life. Conclusion - Infinitely wise, open, and extremely interesting.